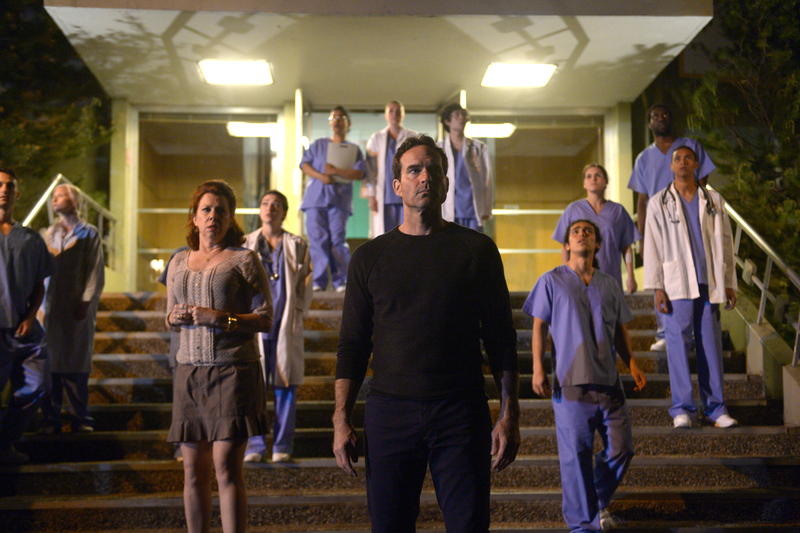 By now, you should be completely engrossed with season 2 of FOX’s Wayward Pines. 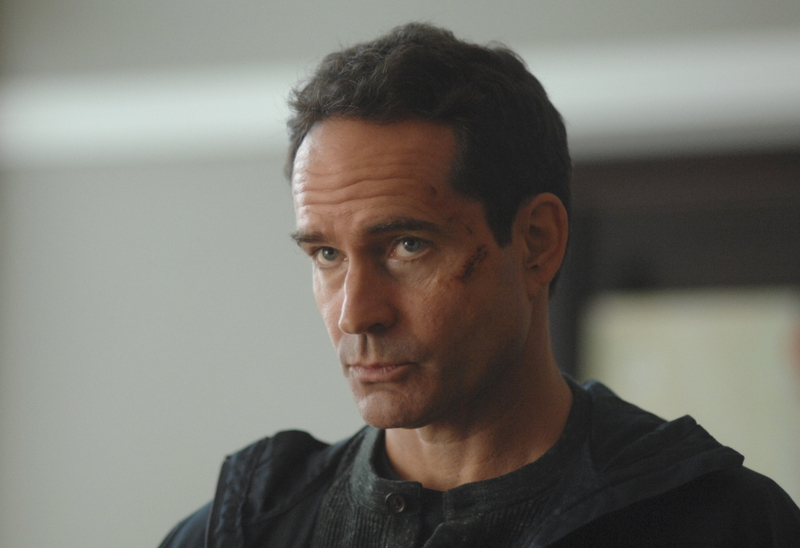 OHSOGRAY talked one-on-one with star Jason Patric about his decision to branch into television, the appeal of the post-apocalyptic genre, and why he doesn’t like to watch himself on film. 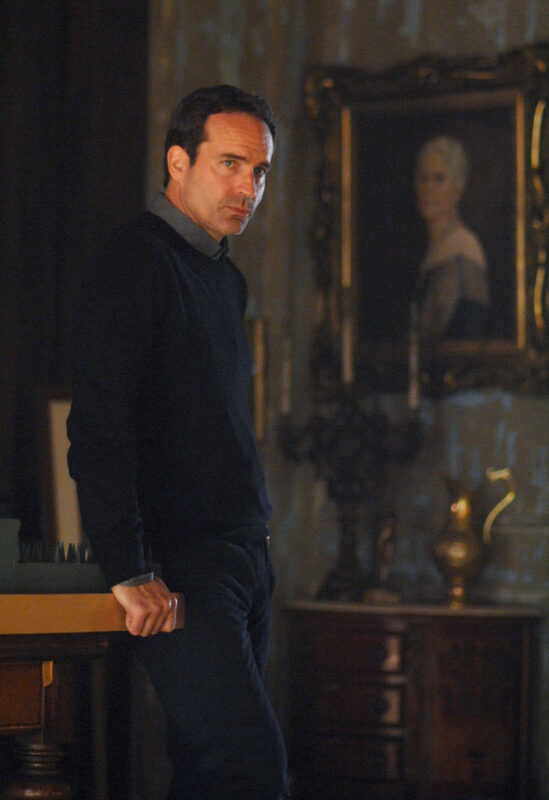 Wayward Pines airs tonight at 9/8c on FOX. 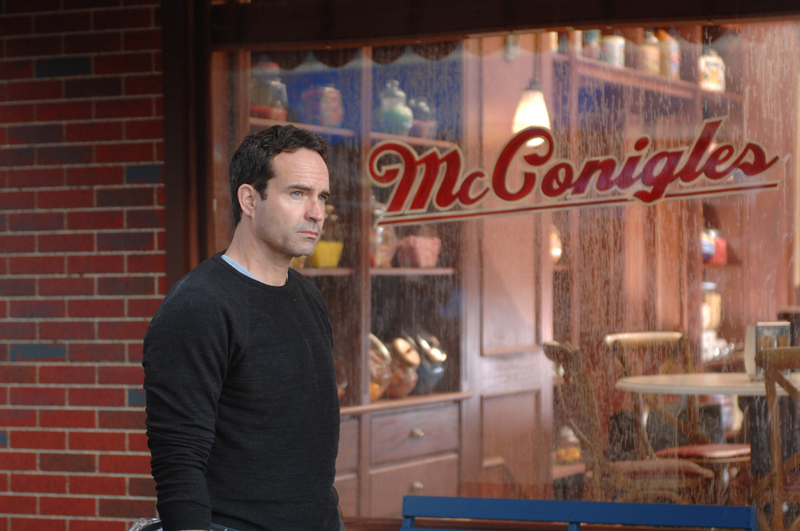 What were your thoughts when you first learned about the opportunity to join Wayward Pines? Did you get the script first? No. I wasn’t looking to do television at the time. The producer I had met, Donald Deline, I’d known years ago and we just had a meeting – a catch up meeting. Then it was fine. Then about a month later, he said, ‘You know, we have this show” [and] he explained it and it sounded interesting. That was that then. What were your concerns about doing TV? That most of it’s bad. Now it’s movies that are bad. You just don’t want to be limited. I’ve always been attracted to characters that are at some primal point in their lives and you want to have the freedom to do that. There’s just so much restriction on television – and this is network. But I think as you’ve seen, this pushes the boundaries of network television. There will be no show on TV like it. There’s no question about – not on network. And you’re not going to find a better cast anywhere. You’re just not. When you look at the diversity of this cast, not just the veterans, those young kids are good actors. Kacey and Thomas and Josh and Christopher, they’re really good. So there was a combination of a lot of things. I mean, you’re really only as good as the team around you. What about the sci-fi subject matter, is that something that interests you generally? No. I find the problem with most sci-fi is that everyone gets in love with the gadgetry and the premise. That’s not what’s interesting to me in those. The best sci-fi movies are that the gadgets and the premise and the time accentuate the human drama – the human dilemma. Something like Blade Runner – yes, it’s beautiful to look at and it’s spectacular the world they opened up, but we’re talking about someone trying to understand who they are, what they are…the basis of humanity. So all those other things put that pressure there. And Wayward Pines is a great proscenium for that and it was set up last year, but this is really, I said it before, it’s like a brand new show. Before, I think the star was Wayward Pines. And rightly so. There’s this opaque mystery to figure out. Now that’s good – you can also get away with a lot of stuff that way. Logic lapses. You can fall into mood as opposed to emotion. There’s a lot of stuff. Can’t do that now. So now it’s really about the characters and their relationships in this town…the world, what’s left of the world. That’s an interesting way to have to form a character. There’s quite a bit of drama between your character and his wife. How is their relationship going to evolve? It’s a very interesting relationship, cause unlike, once again most things in television have to be wrapped up, have to be made very clear for the viewership. That’s not this. You see, when this begins, their relationship is at the end. They’re breaking up. Now all of a sudden, he’s forced in this wild place, with all this pressure to be back with this person, almost paired up. So it’s very complicated, the scenes are very dramatic, almost in a sort of 70s relationship type movie. She’s very good, so it’s an interesting aspect. Are you interested in watching the finished show and seeing how all the abbies turn out? That’s kind of interesting, but I don’t know if I’ll end up watching any of it, really. Is it hard for you to watch things that you are in? Is that because you are looking at your performance critically or is it awkward to watch yourself? It’s weird looking at yourself. But also, most of the movies that I haven’t seen it’s cause I didn’t have a good time doing it. And that’s not the case here. So we’ll see. What do you think the fans are going to enjoy most about season 2? I didn’t realize there was such a growing, rabid fan base for it because I didn’t watch the first year. But in doing all this stuff, there’s a real big fan base for it. I think what [fans] are going to like is that Wayward Pines is there and the familiar faces coming back, but it’s just every single episode there’s a mini cliffhanger. Every single one. Whereas, talking to some of the guys who were in last year, it was all building to the surprise. Then after the surprise, the sort of explosion of it all. But this, you really have to follow the characters more, so at the end of every episode, there’s a fake like twist with someone that is much more emotional. How was it working with Terrence Howard? Will you have more scenes together? I don’t know… I know when Terrence came up to do it, he wants back. [Laughs] He’s back. [I said], ‘You are dead, though.’ ‘No, there’s ways to make it back.’ Terrence wants back. That was just sort of an added thing that’s really nice, but…that’s what I’m saying about the fans…you’re going to have Pilcher come back, Melissa Leo is back and Carla and Charlie, who plays Ben, and Thomas playing Higgins. So there’s all these familiar touchstones but it’s just opened up in such a big way. I don’t know if it was even planned that way, but I don’t think I’ve ever seen a television show that sort of rebooted or reinvented itself in the second season. It’s really like a new show. Has this experience changed your opinion about working on television? Could you see yourself doing it again? I would approach it the way I have just anything – with movies – it’s where I am in my life and who’s involved in the situation, as I’ve said. You’re not going to find a better, more interesting cast in movies or in television. It’s getting used to doing an extended arc. I’ve never done that before. For the abbies, they are very primitive creatures, but are we going to see any variation in that? Oh yeah. The abbies have been greatly underestimated is what you’re going to see. Greatly underestimated. You mentioned the big surprise of season 1 that the abbies exist. Is there any similar surprise lurking in season 2 that will blow people away? Yeah. There are. What’s interesting in how they’ve written this, every episode has that sort of little, mini cliffhanger or a punch to the gut. I think you feel it more because you’re more involved with the characters. The characters were forced to be richer because that’s what this is about now. These people that are surviving in this place. Ok, here’s the secret, this is what it was…great, now what would people do in that place. How are they going to survive the pressure and, ultimately, the battle within and from the outside. This apocalyptic genre is very popular. What do you think it is about the human psyche that we’re fascinated by these kind of stories? I think people want to see devastation and they want to see things stripped down. So you get to the elemental self. They may not want to do that themselves, but they like to watch someone where it’s totally stripped down and there’s no cellphones and there’s no Twitter, and all this other crap. So you can just see people react in a raw way. Are there any particular TV shows that you are into? If I have friends on something, I’ll watch. I watched The Knick, the two years, and thought it was just phenomenal. There’s a consistency – the same writers wrote every episode […] and I thought the performances…I’ve never seen New York filmed that way. So it was really amazing stuff.